Discussion in 'Game Reviews' started by Obsidian Spire, Aug 13, 2012. Genre: Mainly 3rd person/ some 1st person shooter. Stealth, action, and espionage. Available on: PSP and PS2. PSP is original; PS2 is port, supposedly of poorquality. # of players: 1-player story, 2-8 local multiplayer, and up to 8 players online. Syphon Filter is a long running stealth/action series, which began on the Playstation in 1999. The series comprises seven titles all from the same development team, Sony Bend. The results from this team have been of varying quality, but I wouldn’t know anything about that because this is my first foray into Syphon Filter. How does Dark Mirror stack up to its competitors such as Metal Gear Solid and Splinter Cell? Read on to find out. Gabe Logan and Lian Xing are operatives for a secret government organization, the International Presidential Consulting Agency (IPCA). This organization is contacted to infiltrate Kemsynth Petroleum, an oil manufacturer in Alaska. The initial assault encounters resistance and the IPCA suspects that their mission may not be as simple as previously thought. Red Section, the hostiles that now control Kemsynth, may have a sinister plan that Gabe and Lian must unravel before a deadly virus is unleashed upon an unsuspecting world. Can we fix it? Yes we can! Most of the game occurs in third-person, with the player trying to sneak past the Red Section grunts, so they can uncover the ultimate goal of Red Section. Gabe and Lian are the main playable characters and they are essentially the same, just with different textures for their model. Both of these characters must shoot their way through hordes of enemies, search for evidence, avoid enemies to maintain stealth, and defeat the various leaders of Red Section. The variety of weaponry adds to the appeal of this game, with over 30 weapons spanning several categories, there's literally something for everyone. Each character can carry 7-8 weapons, only one of each of the 4 general gun categories, some grenades, and hand-to-hand weapons, until unlocking special features such as dual-wielding. Within special guns are darts for explosions, shock, or gas. The characters always carry 4 special views with them: a flashlight, night vision, thermal, and a special pair of goggles called EDSU, which informs the player of important objects in the environment. The game play is easy to learn, but the developers put some obtuse secrets into this game to adjust the difficulty curve. The music in Dark Mirror is normally excellent, but at times, the music would inopportunely cut out and stop in the middle of a tense standoff. The voice acting is great, but the clips continue to play after the character’s dead, so some amusing situations can arise. Example: Player dies right after starting to say, “I can’t dodge bullets for you”. The clip continues to play after your failure to dodge a bullet. Sometimes enemy deaths precede hilariously ironic dialogue from the dead corpse.The music clips are hidden secrets that the player can unlock, along with other goodies, if they find all hidden evidence in a level. Three modes comprise the options for controls: Standard, Advanced, and Classic. I only utilized Standard as it is the default, but the other two are for special cases.The controls all work. Everyone that believes the PSP should have another analog stick should try this game. I don’t deny that this addition would allow for somewhat easier aiming, but the current format works pretty well. Nice, short levels that are fun to replay and perfect. Player’s skill is rewarded with weapons, hidden levels, hidden goodies, and bragging rights with medals. Multiplayer: I haven’t played the multiplayer because my internet connection has been somewhat odd on my PSP. However, I have heard from a friend that it is well done and entertaining, which I don’t doubt because the developers did an excellent job with the rest of the game. I believe that the multiplayer has medals for the various actions a player takes throughout their games, so as you play you will unlock better and better stuff. The weaponry is varied and entertaining. Have to love shanking people! Stabby, stab, stab! Some hilarious animations of “fired-up” enemies. Story line is somewhat interesting. The story felt incomplete. I always felt confused when they would mention an old character from previous Syphon Filter games. The story should have offered some form of explanation as to who these people are. Some of the secrets in the game are ridiculously obtuse. If you are going to put a secret in the background, which is just as static as its surroundings, no one will notice it. It doesn’t help that these objects aren’t always highlighted by the EDSU goggles. Controls utilize certain buttons too much and are somewhat over-sensitive. I found them hard to get used to, but now that I’m used to them, I want other PSP games to control the same way. Some of the secrets missions just aren’t fun. It’s not entertaining to go bird-watching, even if the bird has some sort of disease to be propagated to the general public. Enemy AI is kind of stupid, even on higher difficulties. “Oh look, enemy spotted. Let’s just stand here and let him take us out while we play “Whack-a-mole!” with cover.” Bosses aren’t much more intelligent. Only a few enemies are remotely challenging. There’s a glitch where enemies will disappear if the player leaves one specific room. This disappearing act also deletes any darts the player shot onto the enemy. Found this on Level 5 part 1. Cutscenes can interrupt action scenes. One time, a cutscene deleted the opposing enemies and allowed me to progress to the next part of the level. Also, cutscenes can show conflicting images with what you are actually equipped with. One fun thing to do is to begin an action, which would normally kill you, right before a cutscene and emerge unharmed while regaining stealth. Messing with cutscenes is awesome fun. In spite of the few issues I mentioned, Dark Mirror is a great game. It definitely entertained me more than the few hours I spent on Metal Gear Solid: Tactical Ops/ whatever the Metal Gear game is called on the PSP. 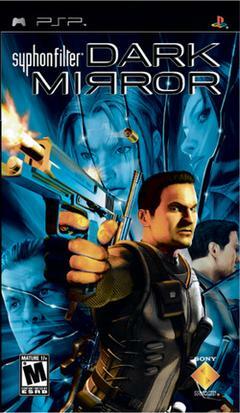 I highly recommend purchasing this game, but if you don’t believe me, here’s a link to the official site, which may still have a demo available: http://www.us.playstation.com/PSP/Games/Syphon_Filter_Dark_Mirror#. I hope my review helped someone!